The 2019 Toyota Prius is now on sale in Canada, and pricing has been announced for all versions of the hybrid sedan, including the new all-wheel drive trims. The Prius received a new front and rear fascia, new alloy wheel designs and two new paint colours—Supersonic Red and Electric Storm Blue. The car’s cabin also gets black accent trim spread across the dash and steering wheel. The biggest change, however, is the addition of the AWD-e system, which will be available in three trim levels. Every Prius is equipped with a 1.8-litre, Atkinson-cycle four-cylinder engine, an electric motor on the front axle and an electronically controlled, continuously variable automatic transmission. The AWD-e variants also get an electric motor on the rear axle, which develops 7 horsepower and 40 pound-feet of torque. In all cases, the Prius produces a total output of 121 horsepower. The AWD-e system activates the rear electric motor on demand, and at up to speeds of 70 km/h for increased traction on slippery surfaces. Instead of a lithium-ion battery pack, the Prius AWD-e gets a Nickel-Metal Hydride battery that, according to Toyota, is “designed to provide excellent performance in cold-weather conditions.” The all-wheel drive system adds five millimetres to the car’s overall height and ground clearance and about 150 pounds or 70 kg to its curb weight, while its fuel tank is reduced from 43 to 40 litres. The front-drive Prius boasts city/highway/combined fuel economy ratings of 4.4/4.6/4.4 L/100 km, while the Prius AWD-e’s ratings are set at 4.5/4.9/4.7 L/100 km. The 2019 Toyota Prius starts at $27,990 before freight and delivery charges, or about $500 more than the equivalent 2018 model. It includes an infotainment system with six-inch screen, automatic climate control, heated front seats, an intelligent key and heated outside mirrors. It also features the company’s Toyota Safety Sense P suite that rounds up pre-collision warning with pedestrian detection, lane departure warning and lane keep assist, automatic high beams and adaptive cruise control. 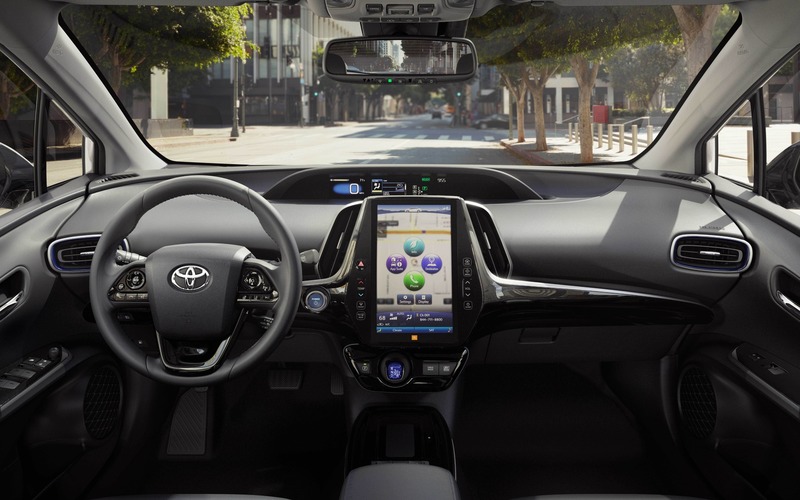 The Prius Technology retails for $32,490 and adds SofTex leatherette upholstery, rain-sensing wipers, a heated steering wheel, blind spot monitoring with rear cross traffic alert, a power sunroof, wireless phone charging, navigation and a seven-inch touchscreen. The 2019 Toyota Prius AWD-e starts at $28,990. That’s a thousand bucks more than the base, front-drive Prius, and it also benefits from fog lamps, premium LED headlights, a SofTex leather-wrapped wheel and wireless phone charging. The $32,990 Prius AWD-e Technology receives an 11.6-inch infotainment display screen—similar to one in the Toyota Prius Prime—while the Prius AWD-e Technology Advanced piles on head-up display, adaptive headlights and park sonar, among other things. 2019 Toyota Prius: Now with All-wheel Drive!